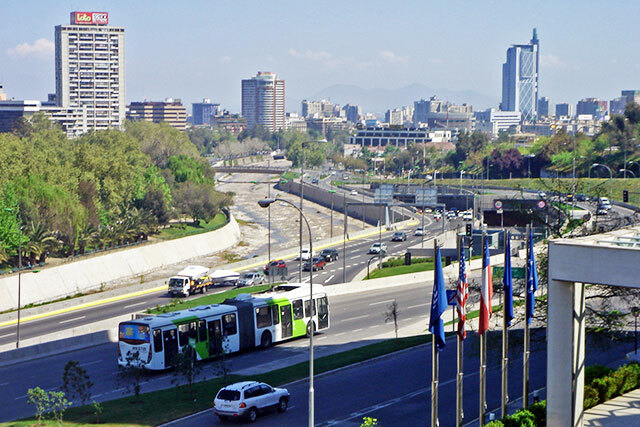 With a large fleet on the way, Santiago, Chile, has emerged as a leader in electric buses. Photo by mariordo59/Flickr. The electrification of transport has taken off around the globe. Cities and transit agencies are experimenting with the latest trends and innovations, spanning the gamut from cars to buses, scooters and bikes. We have seen China lead on electric vehicles (EVs) in recent years, like the city of Shenzhen, which became the first to electrify its entire public bus fleet this year. But a new EV leader is now emerging: Santiago, Chile. Just last week, 100 new electric buses arrived in Santiago and started operations. By next year, Chile is expected to have the second largest electric bus fleet in the world after China, with more than 200 in Santiago. And a new tender is in development to provide incentives for the deployment of approximately 500 more electric public buses in the city by 2020. From the supply side of the equation, Chile has several advantages. It is the world’s number one producer of copper, accounting for around 27 percent of the total amount mined every year. Copper is a very important raw material for electric buses, which consume three times more than conventional buses – almost 814 pounds in some buses – because of their large batteries. Chile is also the world’s second-largest producer of another major material used in EV batteries: lithium. While some countries, like the United States, fret about China’s market dominance in lithium, Chile has little to worry about, with high production and the world’s largest reserves of the mineral. Chile has made strong commitments to reduce greenhouse gas emissions under the Paris Agreement, and transport is a key mitigation sector, accounting for 29 percent of the country’s CO2 emissions in 2013. Transantiago – Santiago’s bus system – generates more than half of all the NOx in Santiago and 450,000 tons of CO2 a year. The average concentration of particulate matter in Santiago in 2015 was also more than double the level deemed safe by the World Health Organization. In part because of its climate goals but also to address air quality concerns, in 2017 the Chilean government published a National Electromobility Strategy. The strategy, prepared jointly by the energy, transportation and environment ministries, puts forward five pillars to lead the country’s transition to EVs. By 2050, the goal is for at least 40 percent of private vehicles and 100 percent of public transit vehicles to be electric. Chile’s climate goals and strong national commitment to EVs provide the country – with Santiago in the lead – a strong foundation for widespread and rapid adoption. Getting to this point has required strong collaboration with input from various levels of government and industries. In 2016, a consortium of public, private, civil society and research stakeholders was formed to foster electric mobility in Chile. The consortium continues operating to this day, coordinating relevant players to evaluate barriers for implementation, develop industrial strategies to boost EV supplies and be a platform for technological innovation. Chile’s largest utility company, Enel Chile, for example, developed Transantiago’s new e-bus business model in conjunction with a bus operator. The city’s 200 e-buses have been purchased from different Chinese manufacturers by two utility companies and will be leased to the bus operators, partially paid for with user fares and partially covered by existing public transport subsidies. Chile’s economically liberal environment has boosted business innovation, providing a wide range of financial and economic opportunities. In 2016, the country imported $57.5 billion worth of goods, with a positive trade balance. Chile has promoted private investment and boasts a strong financial system. This market environment has led to the inclusion of industries that were not traditionally part of the transit sector in Chile’s EV surge, such as utility companies, and encouraged new business models and partnerships that make complex electro-mobility projects less cumbersome. The new e-bus tender by Transantiago, for example, separates capital expenditures and operating expenses among different contractors, so the operator doesn’t have to bare the complete financial and technical burden of new bus technologies. This is following a similar approach as that of the recent procurement process by Bogotá to replace its aging bus fleet. Chile’s strong fundamentals have helped make Santiago a pioneer for e-buses in Latin America and globally. Abundant natural resources, a clear national strategy, the involvement of key stakeholders, and a dynamic economy give it the edge. The new tender for Transantiago could put as many as 500 more e-buses on the streets in the next two years, accounting for around 10 percent of the city’s total bus fleet. The model holds great promise for Chile’s capital and could be a guide for others to follow suit. Jone Orbea is a Manager of Urban Efficiency and Climate at WRI Ross Center for Sustainable Cities.